Although we constantly talk about the value of betting against the public, one of the most popular strategies for bettors is the 80-20 betting system. In the past we’ve discussed how bettors can win at a 57.1% rate by fading large public favorites, but we had not analyzed this system in years and wanted to know whether a more-informed betting public had impacted this system’s profitability. This system is quite simple: find teams receiving at least 80% of spread bets and bet against them. Ever heard the old adage that the house always wins? This strategy ensures that you’re usually on the same side as the house. Although contrarian betting is a consistently profitable strategy, the sweet spot for betting against the public varies from sport to sport. For example, we focused on teams receiving less than 30% of moneyline bets in our MLB Betting Against the Public Report but teams receiving less than 30% of spread bets are not profitable for NFL bettors. Historically teams receiving less than 30% of spread bets have a winning record (51.2%) but that does not win frequently enough to cover the juice charged by the Pinnacle sportsbook. The table below displays how all teams have fared since 2003 when they are not being backed by the public. As you can see, contrarian betting becomes profitable at the 25% threshold, yet our return on investment (ROI) more than triples when focusing on teams receiving less than 20% of spread bets. It’s also interesting to note that only one favorite (Jacksonville Jaguars -3 vs. Tennessee Titans on 9/11/11) has ever received less than 20% of public bets. With the knowledge that this system disproportionately backs underdogs and that historically large dogs have performed better against the spread (ATS) than small dogs, we wanted to see if underdogs of 7+ points had provided superior value for bettors. To accomplish this, we consulted our Bet Labs software and utilized the “spread %” and “spread range” filter to test our hypothesis. Despite our sample size dropping from 182 games to 75 games, the number of units won actually increases from +14.83 to +17.6 and the return on investment sky-rockets from 8.2% to 23.5%. Not only does this prove our original hypothesis, but it also indicates that small underdogs (6.5 points or less) receiving less than 20% of spread bets have been a terrible value for bettors. According to our research, such teams have gone just 53-54 ATS with -2.76 units lost and a return on investment of -2.6%. In the past we’ve also written about how familiarity between teams often benefits the underdog inordinately, so we opted to utilize the “conference/non-conference” filter. The expectation was that both criteria would be profitable, but we would see an increased return on investment in conference games. It turned out that layering on the conference filter nearly doubled our ROI while improving our earnings by nearly three units. 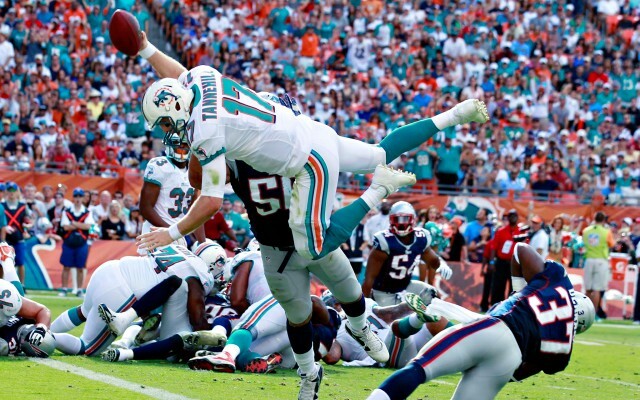 This weekend the Miami Dolphins are travelling to Foxboro to face off against Tom Brady and the New England Patriots in an AFC East showdown. At the time of publication, the Dolphins were receiving just 17% of spread bets as a 7.5-point underdog, thus making them the sixth system match of the current season. Considering that this system has gone 37-14 ATS with a 72.5% winning percentage over the past decade, we love the Fins in this matchup. We offer a 6-day Bet Labs trial for anybody interested in creating their own winning NFL betting systems, but Pro customers have full access to our Best Bets and Bet Signals along with real-time odds, public betting trends and much more. We have also introduced a new free NFL odds page where bettors can access odds, injuries, futures and other valuable information. Current Bet Labs customers can also copy this system from the Think Tank to receive all current game matches via e-mail or text message. Have any questions for the staff at Sports Insights? E-mail us at help@sportsinsights.com, call us at 877-838-2853 or utilize our live chat function to speak directly with a customer service representative. 12/22/15 Update: This system has gone 1-0 ATS during the 2015 NFL season, pushing the all-time record to 38-14 ATS (73.1%). Thanks for updating this theory. What is the record for the 6 games that matches the system this year? Also, to clarify, when you say conference do you mean AFC and NFC or do you means incision such as AFC East and NFC east? This is the sixth system match of the year and the system has gone 3-2 ATS this season. By conference I mean AFC vs AFC. We would use the divisional filter if we wanted to analyze AFC East vs. AFC East. Love this theory! I know you mentioned baseball early in the article, but are you aiming this theory more towards football? I’m wondering what this looks like for all sports.